This tutorial illustrates how to use the Cloud Toolbox to create or edit a standard internet email account settings for your domain name. To learn more about the different types of email solutions available please read Getting Started with Email Services. Login to the Cloud Toolbox System with your Toolbox Username and password. If you do not yet have login credentials please contact your cloud service provider for access to this system. Click on the Manage Email tab. Select or Type the domain name you wish to create an email account for. If you have a large number of domains, the system will automatically begin searching for the domain once you begin typing. Then press the Manage Email button. Wait a few moments and your existing email settings will be displayed. On the Email Accounts tab, click the New Email Account option to create a new email account. Configure your email account settings as as described below. The required settings are described in red and must be entered! Click Create Account to save your new email account changes. If you receive an error message, correct the problem with your settings. Your new email account will now be displayed in the list and is ready to use. For information about how to use your new email account with your preferred software please read the Getting Started with Email Services guide for more information. To edit an email account click the Edit button next to the relevant account in the list on the Email Accounts tab. 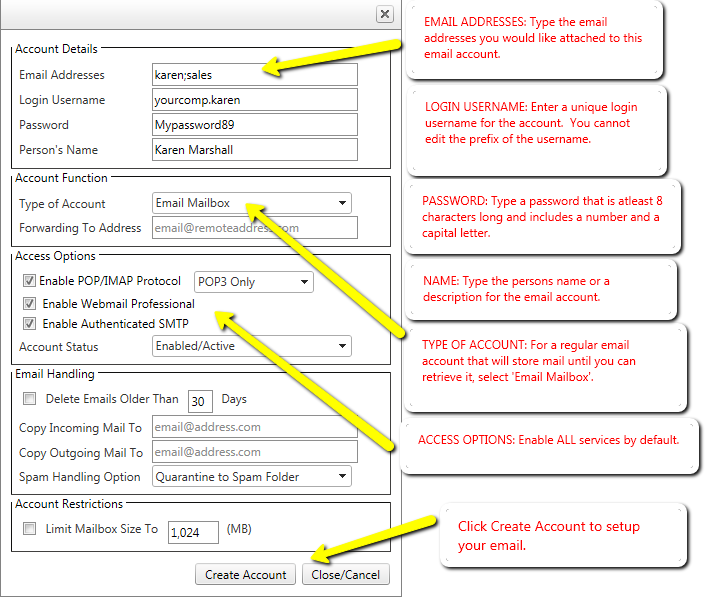 Below is a description of the more advanced settings relating to an email account. The Type of Account defines the behaviour of the individual email account. To allow the account to store email so that it can be accessed via POP3, IMAP or Webmail services choose the Email Mailbox option. This is a regular type of email account. To disable storage of emails and simply forward mail received by this account to another email address, choose Email Forwarder from the dropdown and enter the Forwarding to Address as shown. Note that you can only forward to a single email address using the Email Forwarder option. If you wish to forward email to additional addresses, please see the Email Handling section for adding more recipients. The Access Options define the services available to the user of the particular email mailbox. If the user has software on their computer to download email, then you can enable the POP3, IMAP protocols accordingly. If you wish the user to have access to Webmail then tick the Webmail Professional access option. To allow the user to send outgoing email from their computer using Authenticated SMTP, tick the Enable Authenticated SMTP or Enable Outgoing Email option. You can also disable an email account indefinitely without deleting the account using the Account Status options. Select Disable Login to stop the user from accessing their email, but to continue receiving email for storage or forward. Choose the Disable Login and Reject Mail option to reject any incoming email for this account as well as prevent the user from accessing existing email. The Email Handling options define what to do with email under certain conditions. To delete email stored in the mailbox after a certain number of days since its arrival, enable the Delete Emails Older Than option. Note that if you specify 0 days, email will be deleted every day. To Copy Incoming Email received by this account to other mail recipients, enter one or more email addresses separated by a semi-colon as shown. NOTE that this is a copy-forward, and email will still be stored in the mailbox if your Type of Account is set to Email Mailbox. If you do not wish to store email, change the account to an Email Forwarder, or use the Delete Emails Older Than option. To copy outgoing email sent from the user of a mailbox to other recipients, enter one or more email addresses separated by a semi-colon. NOTE this will only work if the mailbox user is operating from Webmail or Authenticated SMTP. Email sent outbound through other external mail service providers cannot be forwarded. The Spam Handling option defines what to do with email detected as being SPAM. If the Type of Account is an Email Mailbox, you can choose to Quarantine the SPAM email to a 'Spam' folder which is accessible via the Webmail Service or via IMAP protocol. Alternatively you can choose to have the SPAM email delivered to the inbox like regular email, but with a SPAM Label Tag in the subject line. Whilst this will not stop SPAM from being delivered, you can use your desktop email software to filter or redirect spam to a particular folder as required. You can limit the available storage of a particular users mailbox by enabling the Limit Mailbox Size To option and specifying available storage in Megabytes. At 90% storage capacity the user will receive a warning email and at 100% capacity the email account will no longer accept new email.